Don’t worry about being thrown in at the deep end. You’ll join 861 (Wideopen) Squadron as a trial, when you get to know the other cadets and start basic training. You will then be gradually introduced to activities as you progress, so you can make the most of every opportunity that comes your way. Camping – Work on your survival skills and learn your strengths in a team. Easter/summer camps – As you advance through the ranks and classifications, you can take part in these popular camps held at active RAF stations around the UK. Overseas camps – Spend 10 days in Cyprus with fantastic weather, swimming, sailing, and maybe even see the Red Arrows practise their displays (they train there). Head to Germany where you’ll visit a city or cemetery from the First and Second World Wars. You may even get to fly in helicopters and other various aricraft – another exciting possibility for cadets. Adventurous training – A huge part of cadet training. We have two centres, at Windermere in the Lake District and Llanbedr in coastal Wales, both with stunning scenery. Rock climbing, abseiling, high-level hill walking, mountain-biking, canoeing, high rope work and sailing are all par for the course. Gliding – Soar to success! There are fantastic opportunities to glide while you are a cadet, with the ultimate goal being a solo flight. Training is in three stages: a Gliding Induction Course (GIC), Gliding Scholarship (GS) and Advanced Gliding Training (AGT). Air Experience Flights – Feel the thrill of powered flight, with a fully qualified pilot to guide you through taking control of the aircraft yourself. Not only have the opportunity to learn about the flying controls but you’ll experience aerobatics and low level flying too. 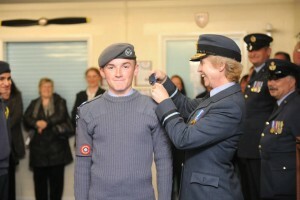 Air Cadet Pilot Scheme – The pinnacle of flying as a cadet, for advanced handling. Complete this successfully and you’ll be awarded your cadet pilot wings. And if you do exceptionally well you could be recommended for further training which will help towards your Private Pilot’s Licence! Air Cadet Pilot Navigation Training Scheme – A great opportunity to use your navigation skills, this two-week course where you fly for up to eight hours is open to selected cadets. Success will lead to you gaining your ‘wings’. You may have more talent for it than you think. Leadership qualities are in all of us and the camps that we offer will help bring them out. Make it through and you’ll be a more confident and responsible cadet having learnt the full benefits of working in and leading a team. Then, for an extra challenge, you could find yourself at the Cadet Training Centre at Frimley Park in Surrey. All cadet forces throughout the UK (and some from overseas) attend courses there. Really flex your skills and you could come out with a trophy for your achievements. A key part of the cadet experience is your progress through the training syllabus. Set out in stages for you to work through, it enables you to open up more possibilities for activities, specialist technical training and rank promotion. The syllabus is made to be as fun ans interactive as possible, meaning that you will enjoy all aspects of learning while being a cadet. We expect a lot from you – it’s a serious commitment to be a cadet – but once you’ve experienced it yourself we know you wouldn’t have it any other way!